I was on my way to Eureka Valley in Death Valley NP to meet up with Brian French for a 4-5 day trip to climb some P1Ks around the valley, a very long drive from San Jose, about 9hrs-worth. As I was heading across the Central Valley it occurred to me that I might stop in the Southern Sierra for a short bit of easy peakbagging. There are a handful of unnamed peaks above Cranebrake Flat on the way to Walker Pass that I had driven by countless times over the years, only recently looking them up in the database to see that they had sufficient prominence to qualify for peaks on LoJ. Once I had decided on this course, it made it easy to decide between the SR178 vs. SR58 option across the Sierra. SR178 took me up the Kern River Canyon, beautiful this time of year with the hills green from the abundant rainfall this season. It was still too early for the profusion of flowers that is sure to follow, but the fresh green grass made the normally brown slopes simply delightful. Lake Isabella was more full than I've seen in years, though still well below capacity. Yet it portended of great promise for ending California's years-long drought. Having left San Jose shortly before 8a, it wasn't until 1p that I arrived at a small turnout along the east side of the peaks where the highway turns south to start its climb up to Walker Pass. I had used this small turnout on a previous occasion not too many months ago to take a shower. The highway sees enough traffic that I didn't have much privacy, but at my age this doesn't seem to bother me much anymore. The first summit, Peak 4,325ft is directly above where I parked to the northwest and took all of 15min to climb the 400ft to the summit. 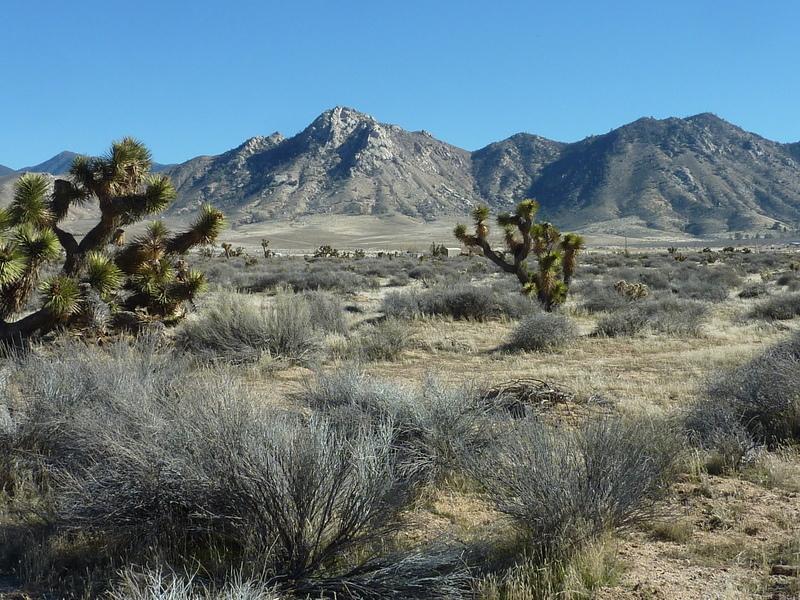 It has a nice view overlooking Canebrake Flat to the west, Owens Peak to the east and the next summit, Peak 5,388ft to the south, more than 1,000ft higher. One has first to drop more than 300ft to a saddle before starting the climb along the connecting ridgeline, some easy scrambling found along the last third of the route. It took an hour between the two summits, separated by just over a mile. I had originally thought I would head back from here, but having made good time I decided to continue up the ridge to the third summit, Peak 5,796ft. This had more difficult scrambling, most of it on crumbly granite rock but none of it more than class 3. There were more ups and downs along the way and the distance was just over a mile, but this leg took a little less than an hour, getting me to the highest of the three summits shortly after 3p. The return went fairly quickly down the east side along a ridge and then dropping into a wash that led back to the highway in quick fashion. I tried unsuccessfully to hitch a ride back down the 1.5mi of highway to where I'd parked. Though several dozen vehicles came by while I had my thumb out, none thought me sufficiently interesting to stop, let alone slow down for a look.